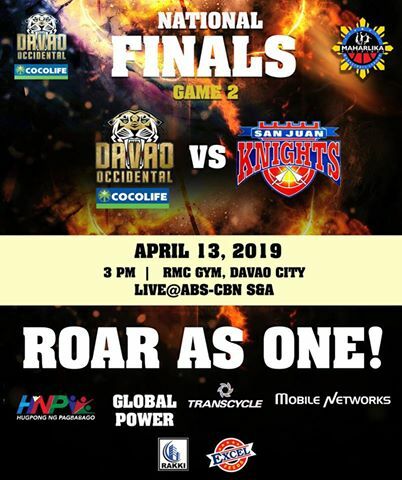 Here are the details for Davao Occidental Tigers vs. San Juan Knights in Game 2 of their best-of-five National Finals series in the 2018-19 MPBL Datu Cup. The Knights defeated the Tigers in Game 1, 84-74. The Davao Occidental Tigers evened the National Finals best-of-5 series at 1-1, after defeating the San Juan Knights in Game 2, 67-60. Billy Robles and Mark Yee lead the Tigers in victory. Robles scored 17 point, while Yee recorded his 20th double-double performance of 16 points, 10 rebounds to go with four blocks. Mike Ayonayon had 17 points for the Knights. John Wilson and Mac Cardona, who led San Juan in Game 1 win, finished with 4 and 8 points, respectively. Game 3 will be played at the Filoil Flying V Centre in San Juan, the home court of the Knights.